Your daily oral hygiene routine is an important part of your overall dental and general health and crucial in keeping your teeth healthy and free of tooth decay and gum disease. Developing good oral hygiene habits to strengthen this daily routine will only benefit you and your teeth. Find out if you are keeping good oral hygiene habits with Corporate Center Dental Care in Lexington, KY. Technique: Brushing your teeth properly can help you get your teeth clean the first time without leaving residual bacteria or food particles. Use a soft-bristled toothbrush and fluoride-containing toothpaste to brush your teeth at least twice a day for two minutes. Look for the American Dental Association’s seal to ensure you are buying quality products. Use gentle, back-and-forth and circular strokes to clean the front and back of every tooth. Flossing: Use dental floss to clean between each tooth at least once a day. Be sure to gently slide the floss between the teeth and reach all the way underneath the gumline to extract any plaque and bacteria which could have built up underneath. Do not forget to floss the back side of your last molar. Regular Examinations: Dental examinations every six months will help your dentist find and treat problems early to provide you with the best dental care possible. 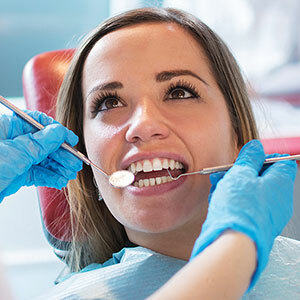 If left untreated, simple dental issues like cavities or gum disease which require simple solutions can evolve into complex conditions requiring invasive treatments. Routine Cleanings: Cleanings performed by a dental hygienist remove any plaque and tartar build up on your teeth. While you can remove plaque at home with regular brushing and flossing, once that plaque hardens into tartar, a professional cleaning is the only way to clear it from your teeth. Cleanings occur during your regular dental examinations every six months. Tooth-Healthy Diet: Eating calcium-rich foods and avoiding known decay-causers like sugary drinks and candies can help keep your teeth healthy. Additionally, crunchy vegetables and fruits and drinking plenty of water throughout the day can help keep your mouth in tip-top shape. For more information on good oral hygiene habits or regular dental examinations and cleanings with your dentist, please contact Dr. Anthony Feck, Dr. Maxie Combs and Dr. Carol Wilson at Corporate Center Dental Care in Lexington, KY. Call (859) 223-4644 to schedule your appointment with your dentist today!